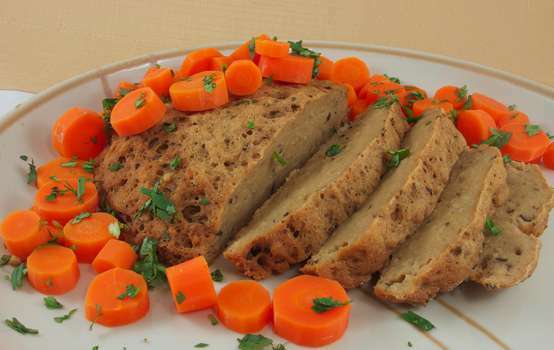 I always get questions about how to make gluten-free seitan. When Herbies ask how to replace the vital wheat gluten, my go-to recommendation is OrgraN’s Gluten-Substitute. I can't tell you how many emails I've received saying this product has changed their life! Recently, Josh posted his own gluten-free seitan recipe in one of the comment sections, so I asked if I could share it on the blog. 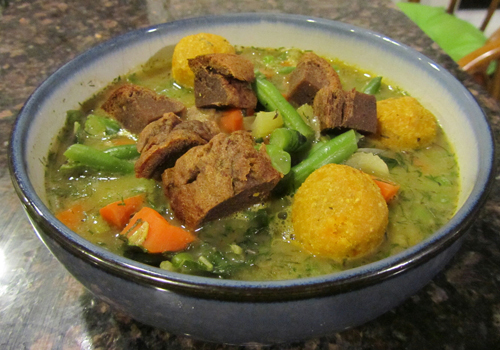 Not only does his recipe include how to make a chicken style seitan loaf, but also sweet potato dumplings and dumpling stew for a complete meal! Preheat oven to 325F. Puree wet ingredients in food processor. Mix dry ingredients in a bowl, then slowly add to wet mixture in food processor. Continue to mix until all ingredients have combined and a dough ball forms. Place seitan mixture on 15 inch long piece of foil (Note: Josh says he greases the top side of his aluminum foil with cooking spray, but I don't think that's necessary for seitan) and form a 12 inch long, 1/2 inch high, and 3 inch wide log. Leave about 1 1/2 inches on either end of dough to edge of foil. Wrap the foil around seitan and twist ends tightly. Bake for 1 hour and 15 minutes flipping over once halfway. Place a large pot filled with cold water about two thirds filled on stovetop to boil. Boil or roast sweet potatoes until tender and mash cooked sweet potatoes. Make vegan egg by mixing egg replacer with warm water according to package instructions. Stir mashed sweet potatoes, egg replacer, flours, salt and pepper together, then knead with hands. Grabbing golf ball size pieces, roll and drop carefully into boiling water, and cook until dumplings rise to surface. 2 tablespoons corn starch or other starch like arrowroot or sweet rice flour mixed with equal parts water. Line a large pot with a thin layer of vegetable broth and saute onion, celery, carrots and garlic. Add green beans and cook until tender. Add kale and vegetable broth. Bring to a boil then add milk of choice and thickener slurry. Cook until thickened. Add chopped dill and serve with sweet potato dumplings and chopped seitan.